Neue Hiobsbotschaften brachen fast durchgehend auf die Rohstoffriesen Vale und BHP Billiton in den letzten Wochen nieder. Crashende Rohstoffpreise und ein schweres Minenunglück in Brasilien sorgten für eine scharfe Talfahrt der Aktienkurse. Die zwei Branchenschwergewichte durchwandern aktuell eine der schwierigsten Zeiten der kompletten Firmen-Historie und sicher die anspruchsvollste Phase während der letzten 15 Jahre. Jetzt wurde die erste, erwartete Mega-Klage in Brasilien bekanntgegeben.. The government attorney general announced the 20 billion real civil damages lawsuit late on Friday, but warned that "the figure is preliminary and could be raised over the judicial process, since the environmental damages of the mud’s arrival at the ocean have not yet been calculated." The November 5 disaster that killed at least 15 people caused 60 million cubic metres of mine waste from the site in Brazil’s Minas Gerais state to wash downstream into neighbouring state Espírito Santo through remote mountain valleys reaching the Atlantic ocean 600 kilometres awayearlier this week. 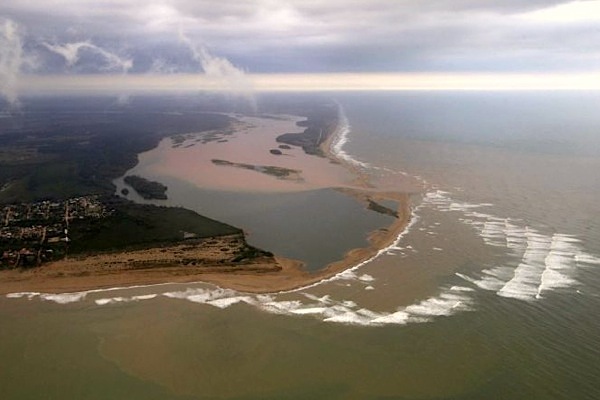 Toxic materials, including arsenic, and high levels of lead, aluminum, chromium, nickel and cadmium, were found in the waters of the Rio Doce by a United Nations team and confirmed by Vale on Friday. Vale and BHP also on Friday announced the establishment of a fund of undisclosed size to help restore the environment. 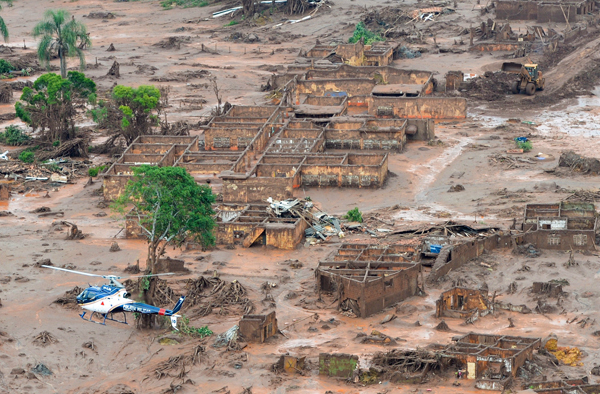 Brazil's environmental watchdog earlier levied a 250 million real ($65 million) fine on Samarco. Die jüngsten Kommentare zur Minen-Katastrophe in Brasilien..
Das passt heute beim Goldpreis mal wieder bestens zusammen. Wasser auf den Mühlen der Systemkritiker, denn offensichtlicher kann eine Manipulation erneut nicht mehr ausfallen. Man achte auf die Kontraktgröße und das das Timing des Mega-Verkaufs am Future-Markt. Wie erwartet will man den (Papier-)Goldpreis noch tiefer sehen. Time will tell..
With the world closest to World War 3 since the cold war era and Russia about to unleash escalating sanctions of Turkey, it makes perfect sense that 'investors' would want to purge themselves of precious metals. "Someone" decided that Friday after Thanksgiving would be the perfect time to dump over 18,000 contracts (around $1.9 billion notional) sending the price of gold futures to their lowest since Oct 2009, below what Goldman called a "crucial level." As Goldman notes, in Gold, the critical level is 1,068-1,066. In Silver, support spans 13.98-13.83. 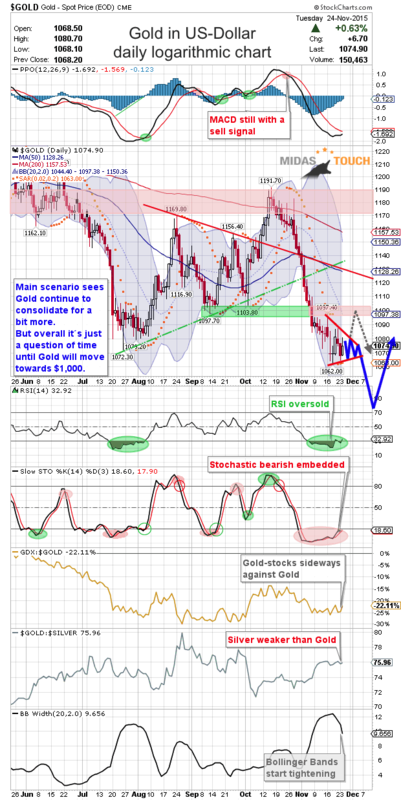 Gold Daily/Weekly – The level to watch in Gold is 1,068-1,066. This includes an ABC equality target off the January high and the trend across the lows since Dec. ’13. The fact that oscillators are diverging positively suggests that price may be attempting to stabilize. Failure to break this support area confirms that the setup is still corrective; that a 5-wave sequence from ’11 highs ended in July. Alternatively, a break lower would warn that the market hasn’t yet completed its impulsive decline. This would open potential to extend towards 966 (a 1.618 extension target from the January high). Silver Daily/Monthly – The level to watch here is 13.98-13.83. This includes the previous low from Aug. 26th and the trend across the lows since Jun. ’03. Although the wave count on Silver is a lot less evident than the one for Gold, it is apparent that rallies have all met ABC targets insinuating that rallies lack impulse. On a more positive note, daily oscillators are crossing higher from the bottom of its range. Put another way, the balance of signals seems mixed; 13.98-13.83 does however look significant..
Am 4. Dezember findet das nächste OPEC-Meeting in Wien statt. Es bleibt äußerst spannend..
After a nasty and brutal sell-off starting mid of October Gold has been consolidating between $1,064 and $1,095 over the last two weeks. Although we are very close to the potential bottom zone around $980 - $1,035 Gold could still continue to consolidate or even start a recovery. The extreme pessimism and the constructive CoT-Data do support a bounce but it looks like nobody wants to catch a falling knife here. So the long expected final move could indeed happen any time and within just a couple of days. Price-wise I don't see much more downside risk (max 8.5%) but time-wise we could still be in for another round of recovery before the bears finally manage to push prices down towards $1,000. While commodity prices are still in a massive downtrend, the US-Dollar continues to push higher. At the same time the yield curve is flattening and negative real interest rates are more and more obvious. 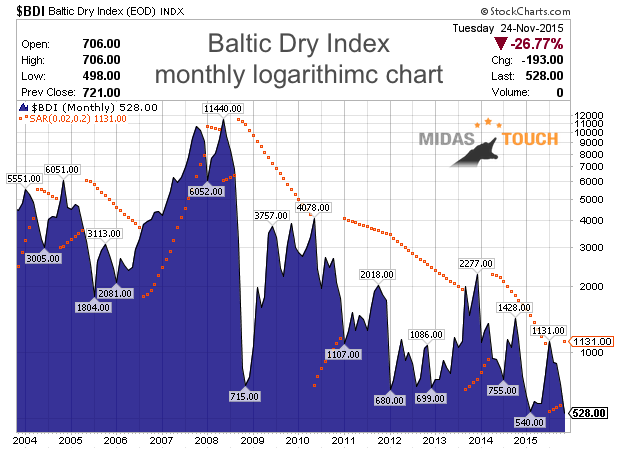 Yet the Baltic Dry Index (as a representative for global trade) is sitting at 12 year lows while the weak oil price is killing the fracking business. The astronomic world wide debt levels will never be paid back and central banks will continue to flood the markets with liquidity just to keep this craziness going. This will only lead to even more distortion and will diminish accurate price signals. Deflation remains the name of the game and what we are witnessing is very likely the final stage of a decades long fiat money experiment. I believe we have to stay away from any risk in these markets and prefer to be in cash even though it might mean to loose purchasing power. 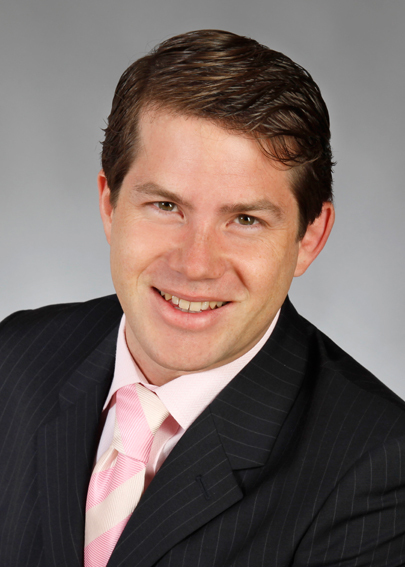 My favorite asset classes remain Gold and Bitcoin. Gold because it represents a 5000-year old track record and freedom from 3rd party risk. Bitcoin because it is traded in a free market and represents the technology of the 21st century. Besides that real estate with a positive cashflow and agriculture are two more asset classes I do like. Stocks in general are probably overvalued and many of them are already in a bear market. 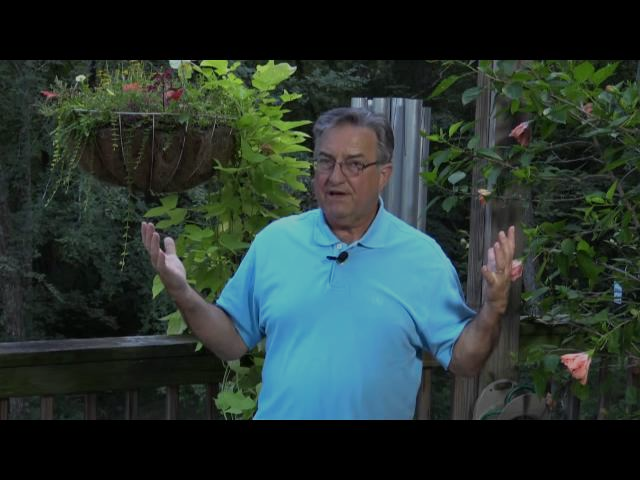 Great video about the biggest obstacle to your making money in trading and investing. In this time of manipulation and fear, government regulation and mainstream conditioning, I will continue to do my own independent research. To support my free work I´d be very grateful if you could support me with a donation. Any amount is welcome and I will honor your trust in my work. 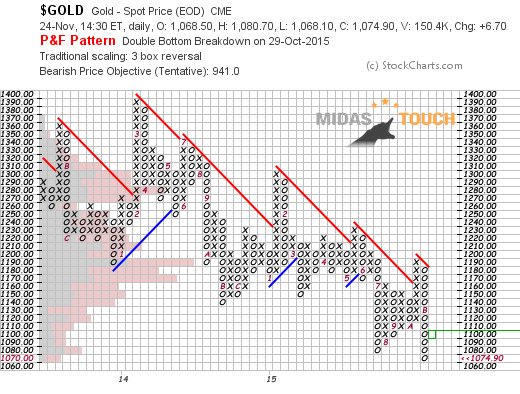 Gold needs a daily close above $1,100 to reverse the downtrend on the point & figure chart. 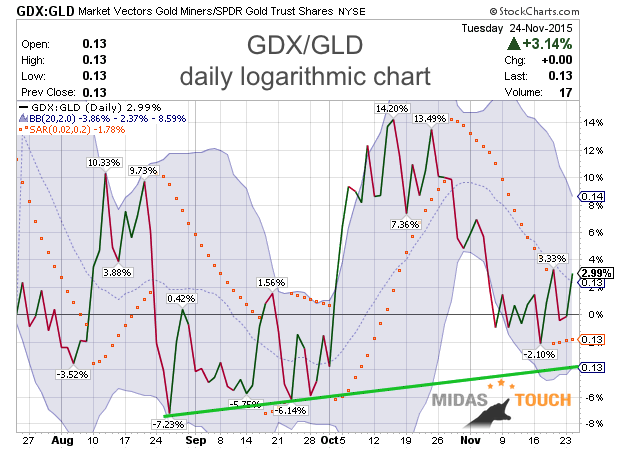 The GDX continues to hold up better than GLD. At the final bottom you want to see the miners ETF positively diverging from the physical Gold ETF. 1 ฿ = 0,3 Gold oz. New buy signals on the Gold USD-Daily Chart, Gold Volatility CBOE Index, Gold CoT-Report, Gold Sentiment, Gold in Indian Rupee, GDX Goldmines-Daily Chart and US Real Interest Rate. New sell signals are coming from SPDR Gold Trust which continues to loose its holdings and from the US-Dollar-Daily Chart. 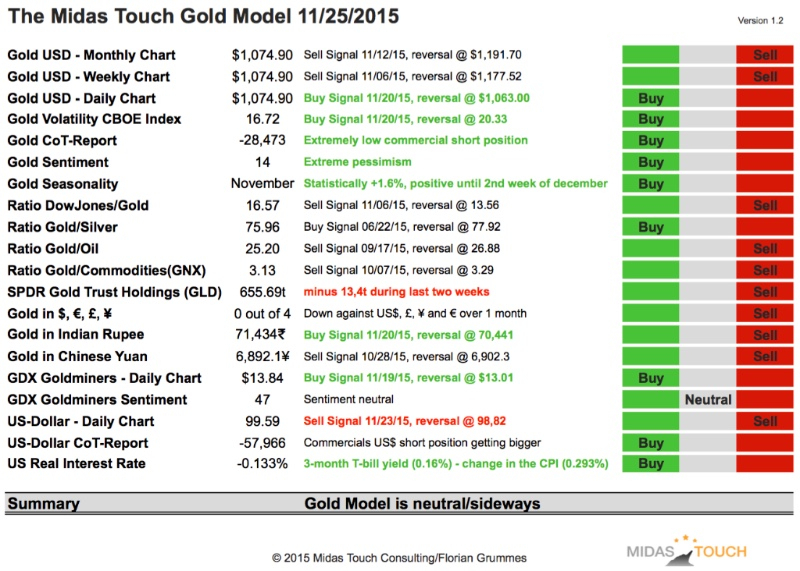 Gold Seasonality remains supportive until second week of December. Overall the model is in Neutral/SidewaysMode since 5 trading days. Gold continues to behave pretty weak. Although $1,064 so far has stopped the sell-off there is no indication of a major low or even an intermediate bottom. The only bounce towards $1,095 was quick, very short-lived and failed already below $1,105. Only a daily close above $1,105 will open up the chance for a recovery towards $1,130 and maybe higher. As long as the slow stochastic remains bearishly embedded the downtrend will continue. Once $1,064 is taken out Gold should quickly drop towards my ultimate target zone between $980 - $1,035. Here I do expect at least a huge recovery but more likely the end of the bear market. Overall we are getting very close to a huge opportunity in the gold market on the long side!! Remain patient but alert and do your homework to be ready once we are hitting $1,025. Swing-traders hopefully followed my recommendation to sell Gold short between $1,175 - $ 1,180 and should now move their stops to $1,095. You might be able to ride this winning trade down to $1,025 where you should cover everything. Copyright © 2015 Midas Touch Consulting GbR, All rights reserved. It's not all about Paris, is it?